Motorized water craft like jet skis and wave runners continue to grow in popularity here in the Eastern Sierra, while water-skiing and wake boarding remain favorite activities, as well. Ride these super-powered machines in crystal clear lakes such as Topaz, Klondike, Grant, Diaz, Walker and Crowley, all open to powerboats. Many rentals are available at the various marinas. Afternoon thermal winds over lakes and ponds make conditions ideal for board sailing in the Eastern Sierra. Popular areas for the sport include lakes such as Diaz, Klondike, Crowley, June and Topaz, as well as the alkali ponds near Mammoth. Crowley Lake is located 25 miles north of Bishop on Highway 395 or 3 miles outh of Mammoth. 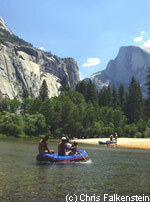 It offers some of the most prestigious trout fishing in California. The huge man made reservoir is a domestic water system for Los Angeles. The lake is 12 miles long and 5 miles at its widest point. Crowley Lake is a facility for storing the Eastern High Sierra snow and rainwater. When the reservoir is filled, it becomes an anglers delight. Crowley Lake fishing season begins the last Saturday of every April and goes through October 31. Opening weekend at Crowley hosts the largest festivities in the Eastern Sierra. June Lake is a natural glacial mountain lake dating back 5 million years. The June Lake Marina was established in 1920 as a base for those sportsmen who found this lake to be the answer to a trout fisherman's dream. 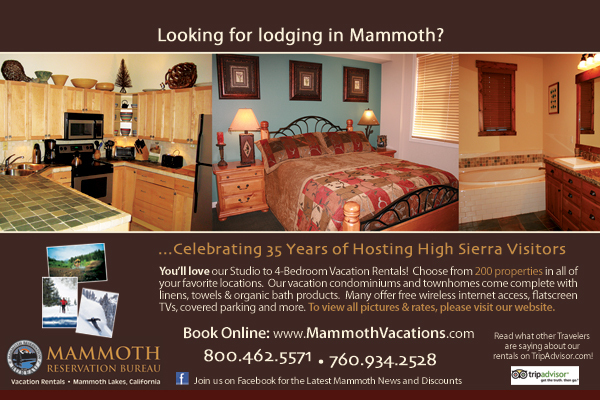 You can call us year-round for information and reservations. The June Lake Marina maintains an excellent beach for swimming, sailing and windsailing. The marina has boat rental, launching, dock space, bait, and tackle. Grant Lake is by far the largest of the four lakes on the June Lake Loop, although, as a reservoir on the Los Angeles aqueduct system, its level can vary widely. The 12,000-foot elevations of the summit of Mt Wood loom just above, as do the lush aspen groves of Parker. On the lake itself, a 10 M.P.H. speed limit is imposed until 10:00 a.m. each day, to accommodate the early morning fishermen. After 10:00, speedier watercraft may take to the lake, and sports such as water-skiing, wakeboarding and jet skiing may be enjoyed. Most of the shoreline is accessible to the public by unpaved roads that connect to both California Route 158 and U.S. 395. Your visit to Grant Lake will reveal a fabulous summer water sports playground, as well as one of the Sierra's premier trout fishing retreats. Boating jet skiing and swimming on Diaz Lake what a great way to spend the day! Diaz is a natural lake that was formed after the earthquake of 1802 when the floor of the Owens Valley dropped 20 feet. Today Diaz Lake is a popular day use area with fishing, boating, picnicking and a playground for the children. Located on the west shore of Diaz Lake is a campground with 200 tree-covered sites with grills, tables, drinking water, and picnic and rest room facilities. There is also a boat launch ramp and concession stand. Camping reservations are recommended and can be made two weeks in advance. Topaz straddles the Cal/Nev state line and a fishing license from either state is honored there. The lake is known for its trophy trout and you can fish most of the year round. Topaz is popular with boaters and water skiers who generally keep their distance from the anglers. You'll find picnic grounds, camping and boat launching facilities located at the northeast shore of the lake. Walker is a haven for boating, fishing, camping, hiking and bird watching. Water skiing and personal watercraft are welcome along with quiet vessels such as canoes and kayaks - perfect for exploring the Walker River Delta or observing loons, grebes, and other water birds. Major beaches and campgrounds include Sportsman's Beach, Twenty Mile Beach, Tamarack and Walker Lake State Park.